As I said, Alphonso mango season is here. Rob and I have been devouring the Alphonsos, savouring each one, and we both thought this was a wonderful dessert to share. Any sweet mango will do, even frozen chunks. If you love mangoes as much as we do, you will swoon over this. So do not hesitate, go get yourself some mangoes! I have been exploring more raw cuisine and have been smitten by the raspberry raw cheesecake at The Beet and the chocolate banana raw cheesecake at Rawlicious. The server at Rawlicious told me it was to-die-for, and she was right. However, since I know it is filled with cashews, it isn’t the most healthy dessert. This is why I jumped at the chance to make this dessert, because it is healthy, flavourful and filled with some of my favourite ingredients. 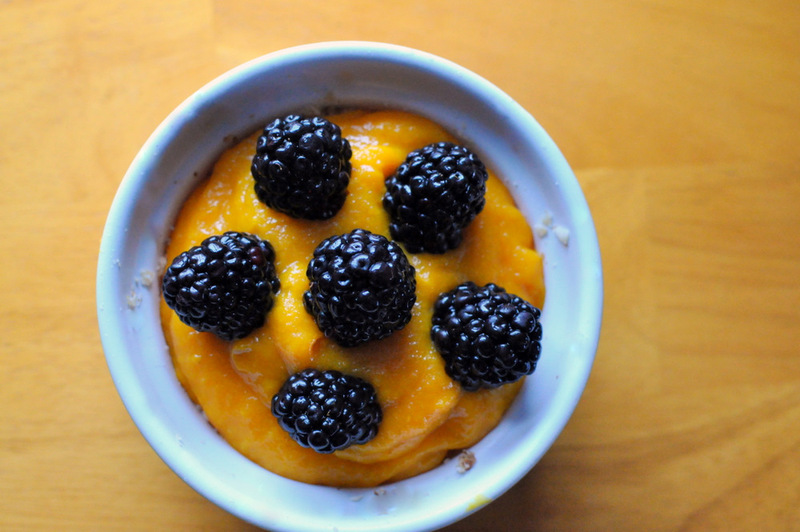 The star of the pie is a mango pudding with pureed sweet mangoes. 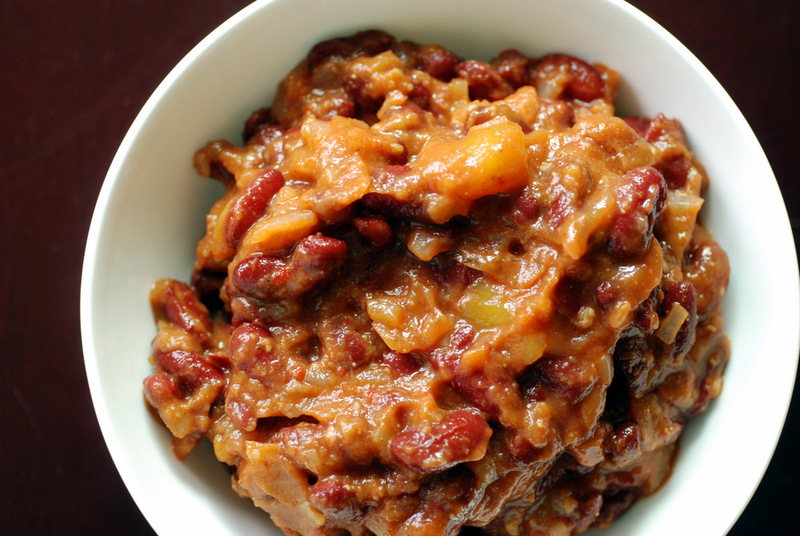 The flavour really pops because it is combined with dried mango slices. 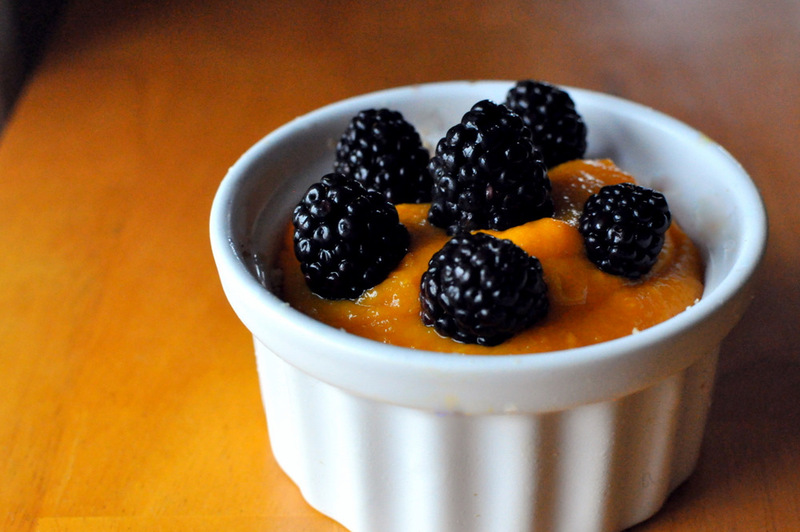 The mango pudding is poured over a coconut-almond-date crust, and topped with your favourite fruit. 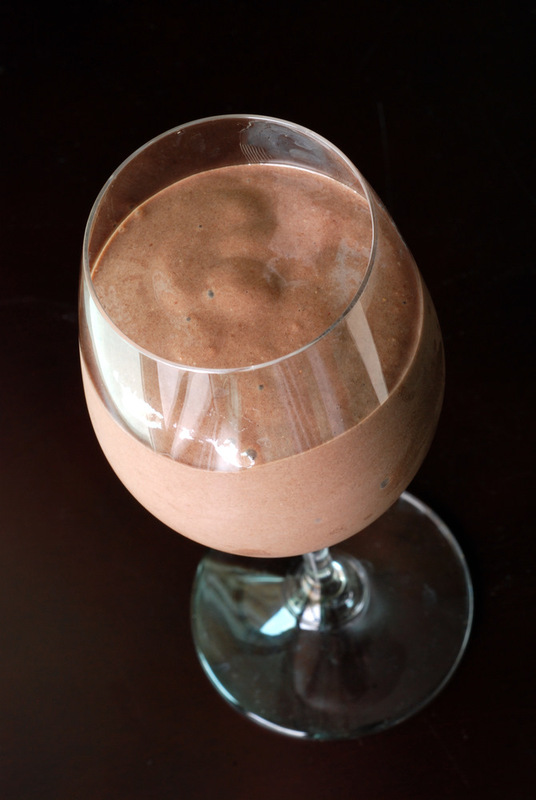 We chose blackberries, but strawberries, kiwis, bananas, anything!, could be used. Together, everything works well. Tropical bliss. 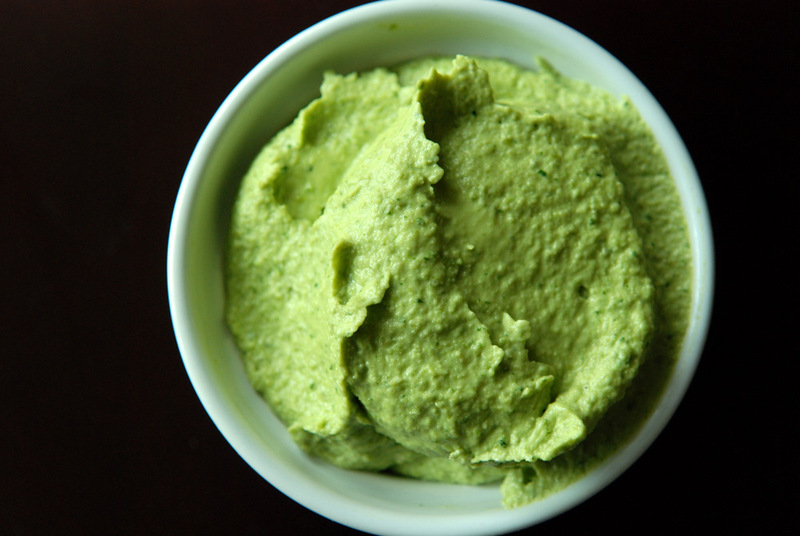 This is being submitted to this week’s Weekend Wellness, to this week’s Raw Food Thursdays, to this week’s Weekend Herb Blogging, hosted by Graziana from Erbe in Cucina (Cooking with Herbs). Alphonso mango season has arrived. Last year, Rob and I devoured the Indian Alphonsos as soon as they arrived in Little India. Succulent, sweet, smooth and sweating with juice (sap? cider? to go with my alliterations..), this is one of the best mangoes out there (although, no, I have yet to try Pakistani or Filipino mangoes). Ataulfos are my second favourite. Rob jumped at the chance to get a crate of mangoes last weekend and shared his bounty with me. I mean, you could easily just eat the Alphonso plain, in all its glory, but I recounted all my favourite mango recipes from last year: Thai Sticky Rice with Mango, Mango Shrikhand and Coconut Rice Pudding with a Mango Puree. I was brought to the tropics just thinking about it. Mango Shrikhand, man that was good. A mango and cardamom-infused yogurt is topped with mango and pistachios. Sounds simple, but works so well. However, I am not eating yogurt right now, so I figured I would try to merry those similar flavours together for breakfast. With my morning oats, no less. 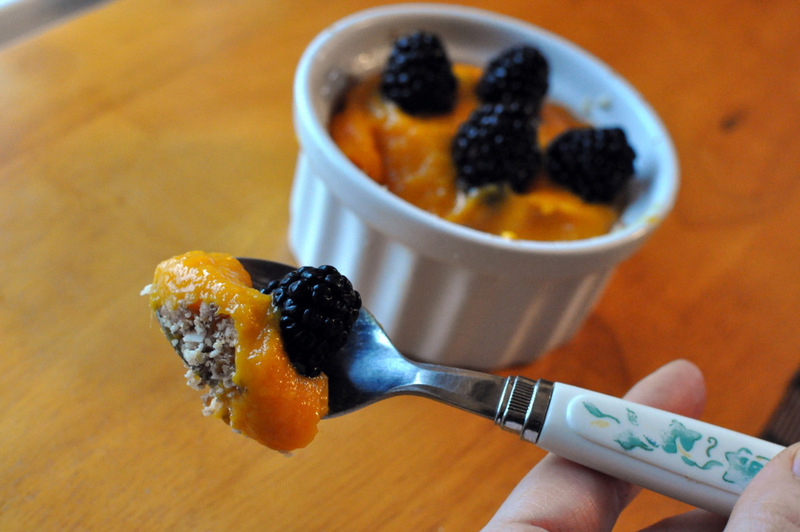 This was how Mango Pistachio Steel Cut Oatmeal (aka Mango Shrikhand Oatmeal) was born. 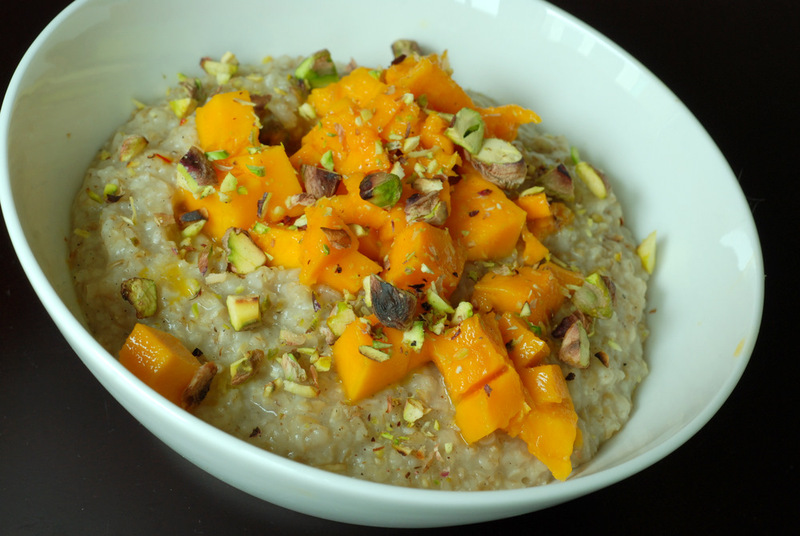 Unlike my previous Mango Oatmeal, spiced with cinnamon and nutmeg, I did not cook the mangoes in the oatmeal. I consider the Alphonso mango too precious to let it disintegrate. If I had an Ataulfo, then I’d certainly throw that in the pot, though. 😉 I let the mango shine overtop the oatmeal, sprinkled with pistachios. 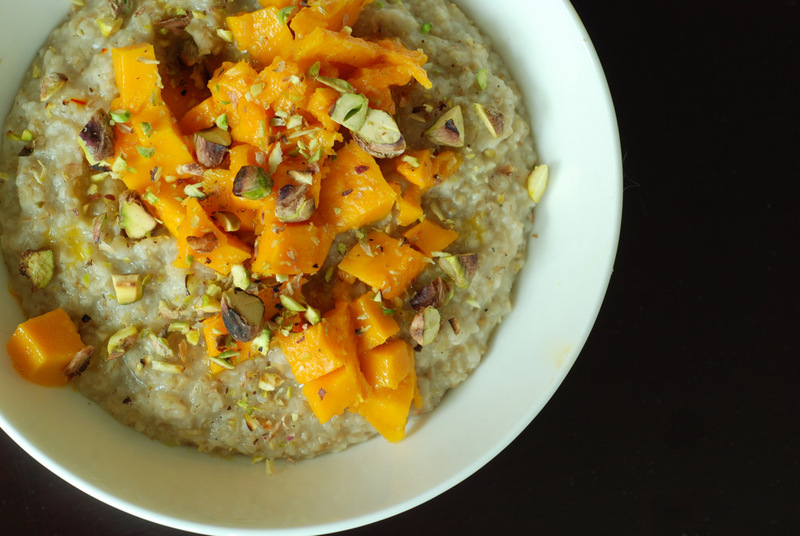 With the creamy base with cardamom and saffron, this was a delicious breakfast. Sometimes greens go on sale, so when T&T had 2 bunches of watercress on sale for 88 cents, I figured I had nothing to lose by trying a new green. I didn’t even know what I wanted to make, but I knew it would come to me. Of course, greens can easily be interchanged. Baby spinach may be sweeter, but Swiss chard could work as well. Want something with more bite? Add arugula. 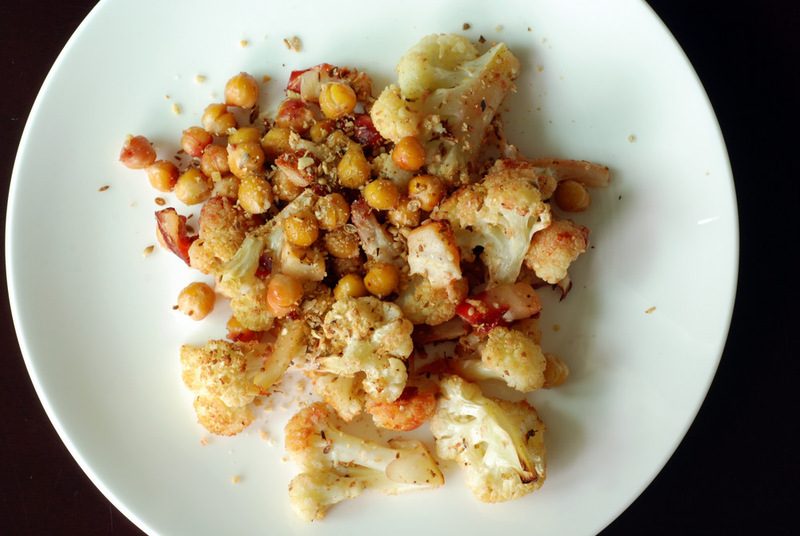 Want something with an even stronger peppery snap? 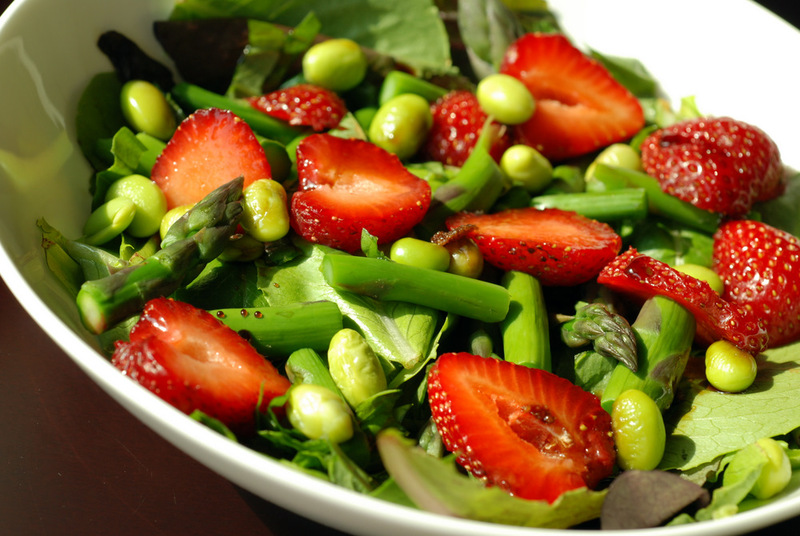 Try watercress! I love Japanese food because it highlights simplicity while balancing all the major tastes (bitter, sour, sweet, hot, salty, and delicate). 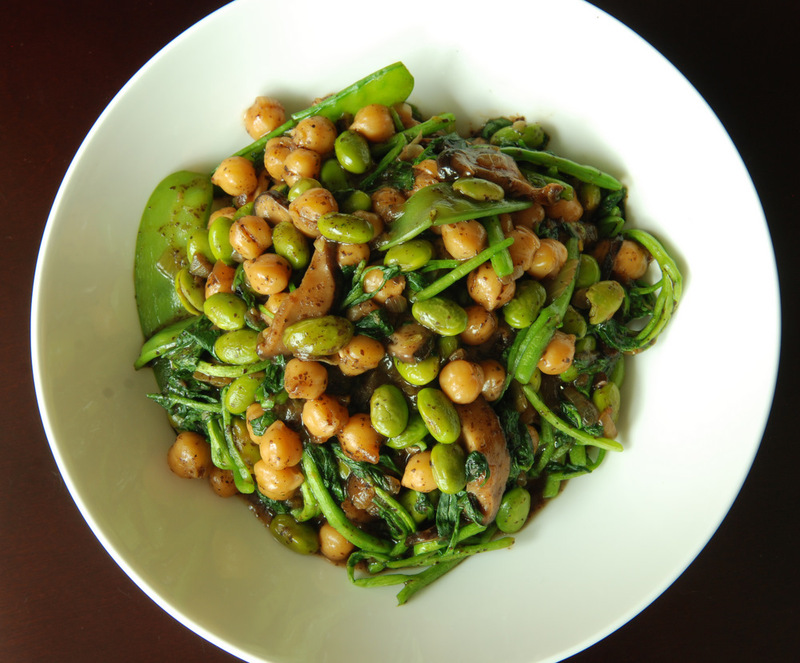 While most of the Japanese dishes I make play more on the sweet side, I loved the change of pace with this more earthy stir-fry. 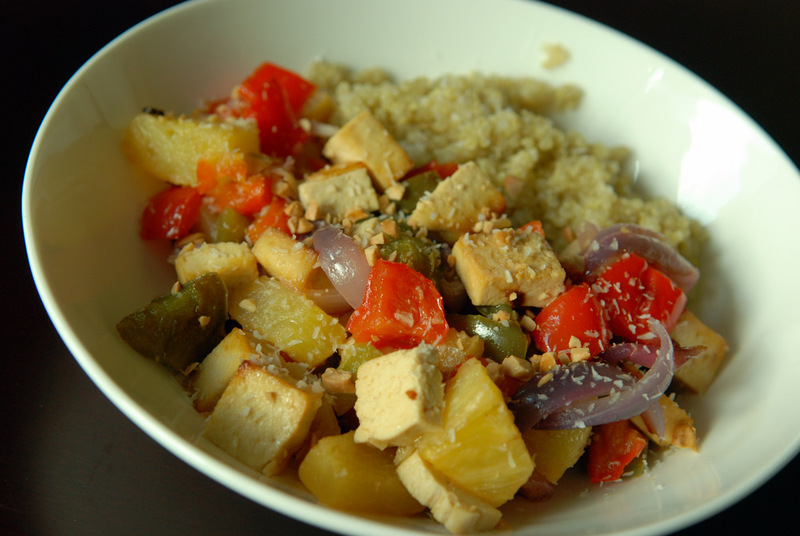 Adapted from ExtraVeganZa, I fooled around with the veggies, but the essence of the dish was the same. 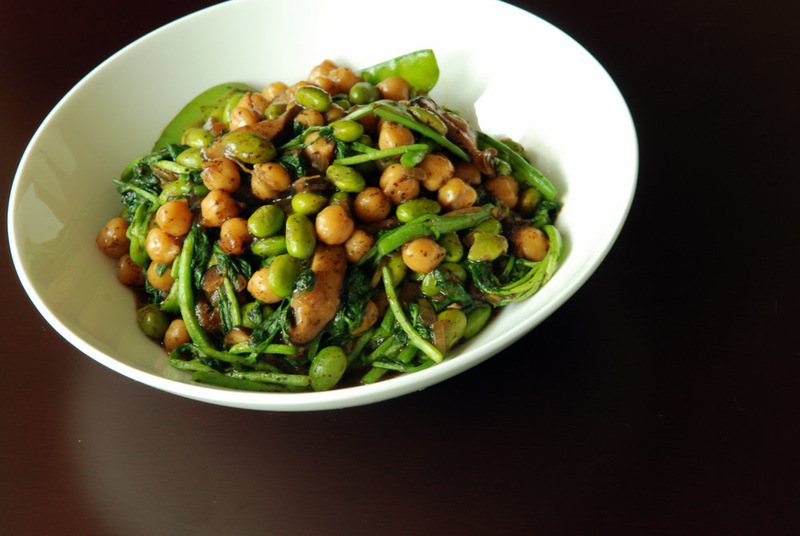 I swapped watercress for the spinach, used more shiitake mushrooms and edamame beans, and added in snow peas. The primary flavours were ginger as well as the earthy-flavour from the dulse (a kind of seaweed). Not sure watercress will make it into my backyard garden, though, as it doesn’t seem to be suitable without lots of water! My mom has been reading my blog from the beginning. My dad, not so much. 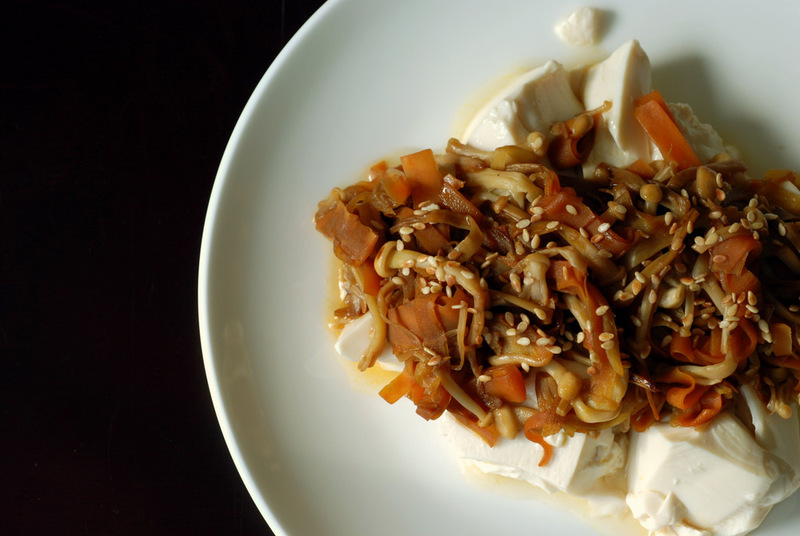 Last summer, he saw the picture of Silken Tofu Topped with Enoki Mushrooms and told me it looked awful. Maybe he said it looked gross. I can’t remember. To me, the picture reminded me how great the dish was. I saw the taste that I remembered, that I enjoyed, so I didn’t think it looked “gross”. Granted, enoki mushrooms are odd-looking things to the uninitiated. My mom still raves about one of my first photos of enoki mushrooms, and how alien-like they look. Attack of the mushrooms!! Personally, I love enoki mushrooms and they are definitely one of my favourite mushrooms. They have a delicate flavour so the rest of the dish is what matters most. It is a shame they haven’t hit mainstream grocers just yet. I usually pick them up at T&T when they go on sale, but yes, my new favourite grocery store, Sunny Supermarket, also sells them. On sale to boot- 2 packages for $2! I wanted to try something that highlighted the mushroom, instead of adding them to a stew. I spotted a great recipe in Kansha, the new vegetarian cookbook by Andoh, who also provided the original recipe for Silken Tofu Topped with Enoki Mushrooms in Washoku. The original recipe was a vegetable side but I decided to beef it up by doubling the vegetable portion and serving it overtop chunks of silken tofu as a main dish. The prep was quite labour intensive if you follow Andoh’s suggestion of making thin matchsticks of carrots and ginger. I did it all by hand since I don’t have a spiralizer (yet). It made for a nice texture that complemented the enoki mushrooms really well, but since everything was stir-fried, I feel that simply shredding the carrots would be equally as good and way easier to do. But the taste, the taste was great. Andoh’s recipes are more subtle, not in your face, which is what I love. It was simple, tasty and completely Japanese. 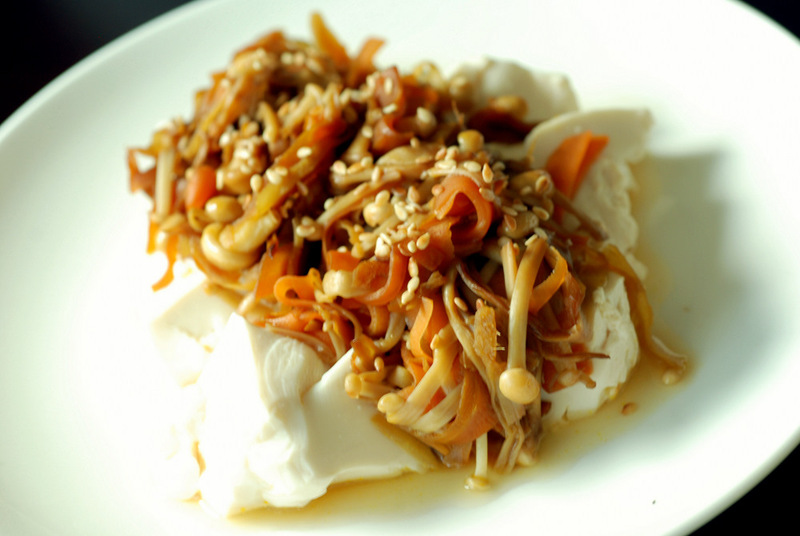 The zip from the ginger was great with the silky background of the delicate enoki mushrooms and silken tofu. This is my submission to E.A.T. World for Japan. My mom recently forwarded an article to me. “Study finds vegetarians have smaller brains” screamed the headline with a link to this article in Neurology from 2008. Gosh, do I need to bemoan how media misconstrues academic research? The article had nothing to do with vegetarian diets, rather it investigated the effect of vitamin B12 levels in the elderly and its association with brain volume. Vitamin B12 deficiency is common in the elderly due to many reasons, and can be a reversible cause of dementia. However, I understand my mom’s concern. Vegans need to understand which nutrients are harder to come by without consuming meat and dairy. There are actually a few, but vitamin B12 deficiency can become problematic since you can only acquire it from meat and dairy, unless you obtain it from a fortified food. 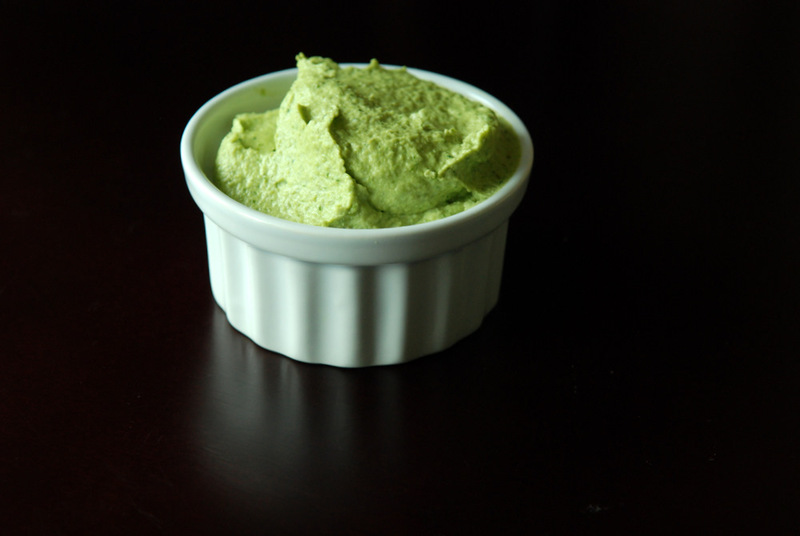 A good source of vitamin B12 for vegans is nutritional yeast, which is fortified with vitamin B12. 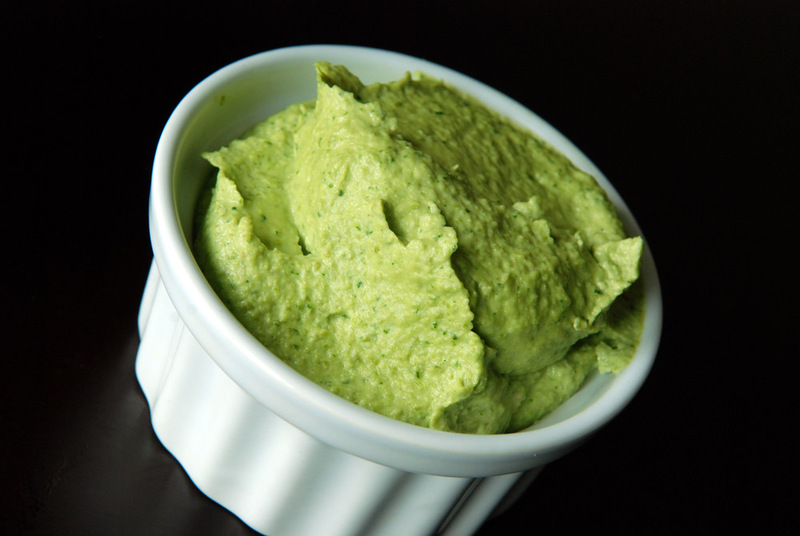 While I first used nutritional yeast to make a creamy zucchini and basil soup, I hadn’t really discovered its prowess until recently. 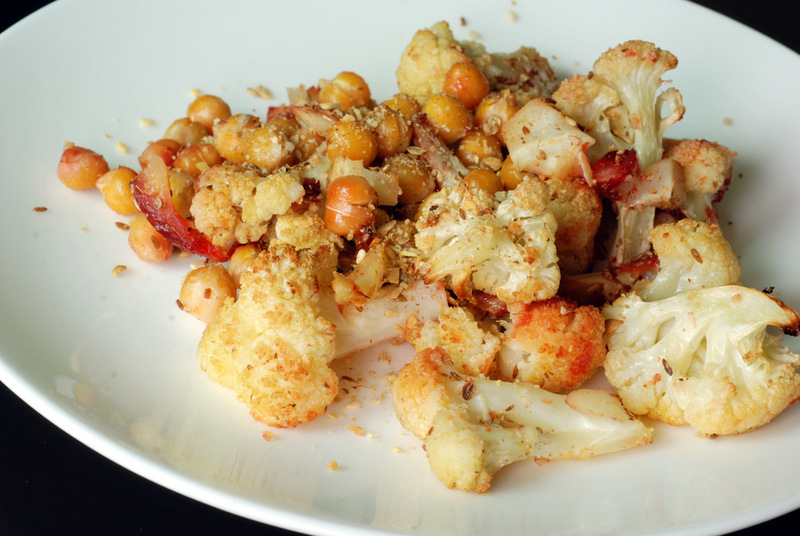 Nutritional yeast is not nearly as scary as it sounds. Its name is true though: it is a nutritional boon for B vitamins and it is an inactive yeast, harvested from beetroot and molasses. 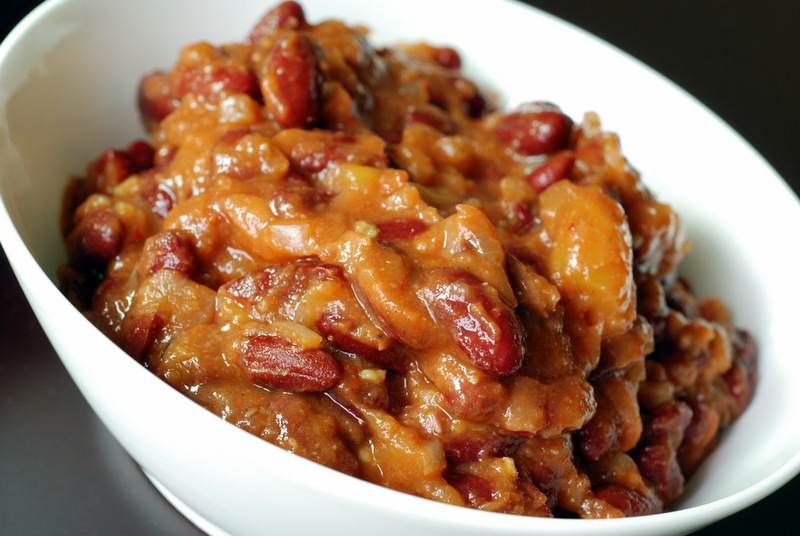 Known as a vegan source of vitamin B12, it is also a great source of protein and fiber. It has a distinctive cheesy flavour, that I have grown to love, although you may need to warm up to it. 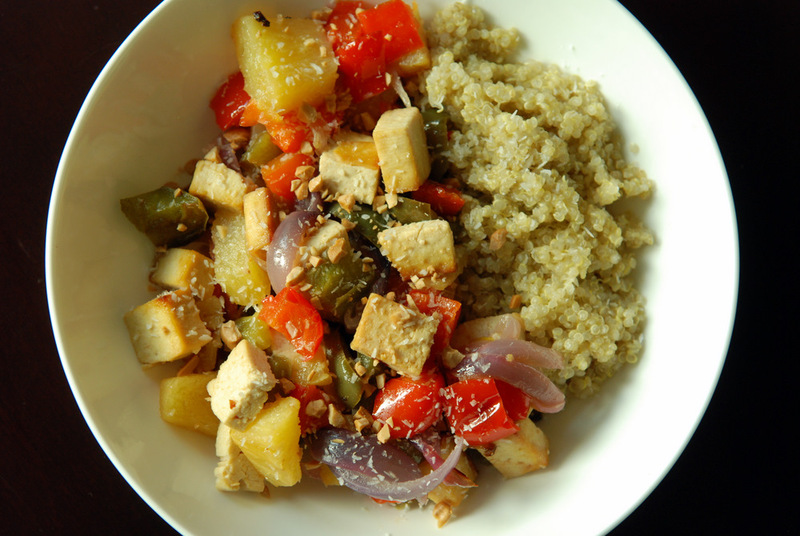 It has that kind of ‘health food’ flavour for the uninitiated but if paired well with other ingredients, it can really shine. You should be able to find it easily in any health food store. 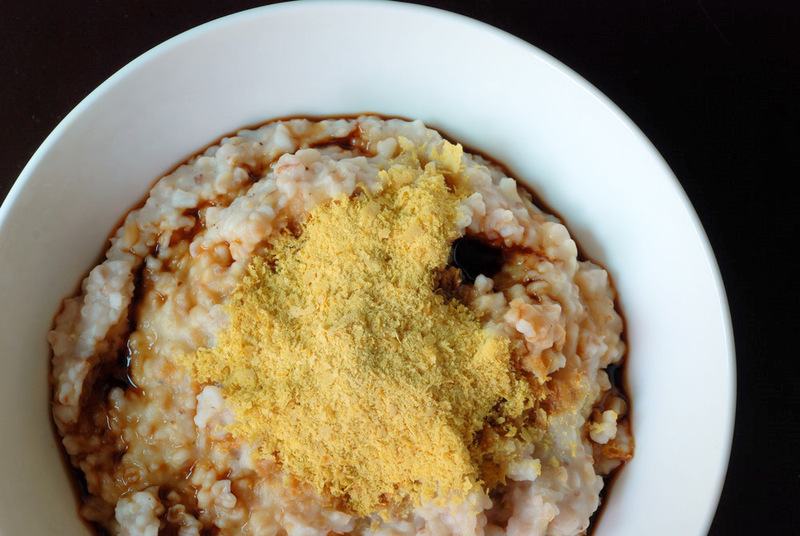 While I love my breakfasts to feature all kinds of fruit, I have recently been smitten by savoury oats for breakfast. 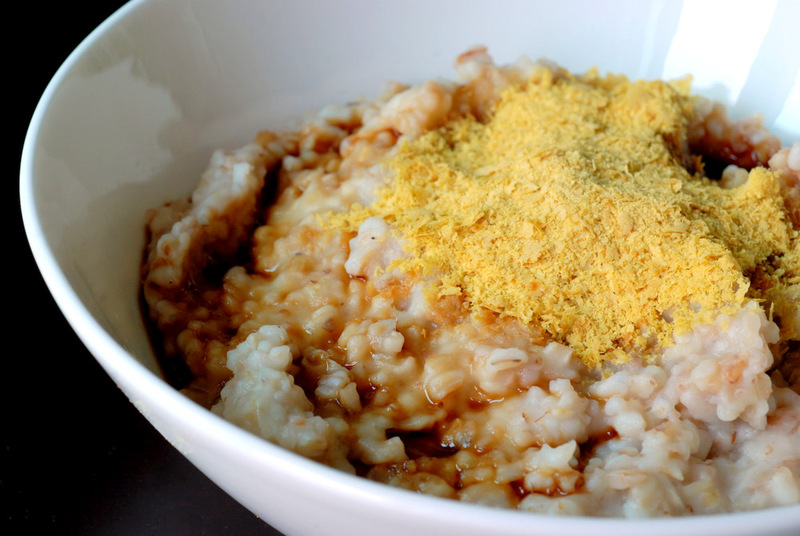 Playing around with different combinations with my big batch of weekly oats, this has been my recent favourite: steel-cut oats with soy sauce and nutritional yeast. 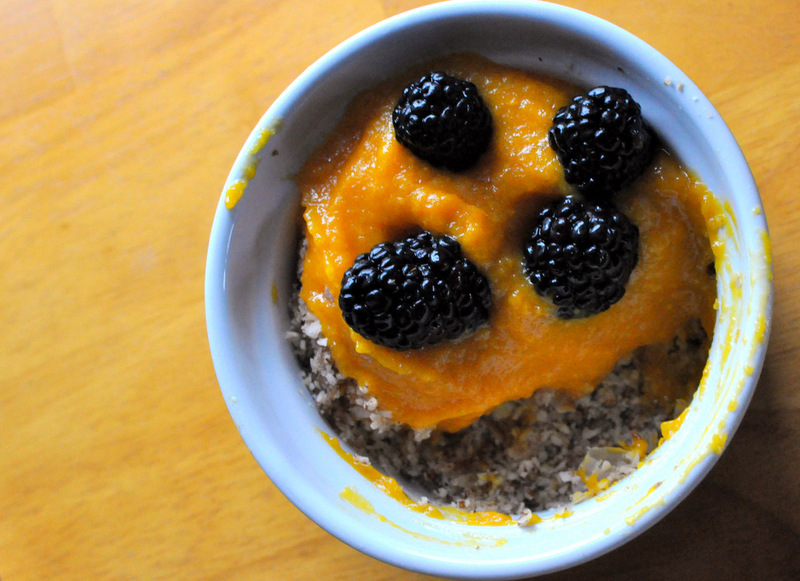 Simple, quick, healthy and a nice change of pace for breakfast. This is my submission to this month’s Breakfast Club, featuring savoury vegetarian breakfasts. I held out for Ontario asparagus. It also announced its entry by being on sale (wahoo!). I did not hold out for Ontario strawberries. The Californian ones were on sale, too, and perfectly ripe after I left them on my counter for a few days. Right now, after chowing down on this salad, I don’t care that I didn’t eat local. 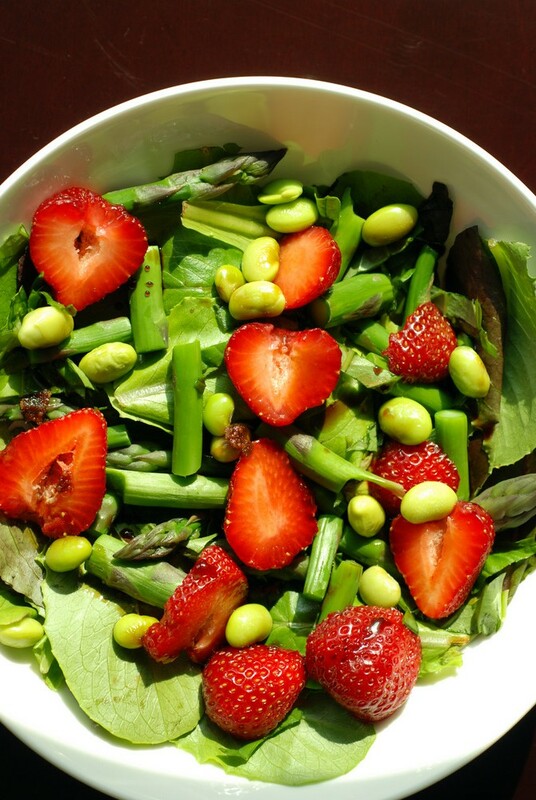 This was springtime in a bowl, with a dash of summer from the strawberries. I was inspired by Joanne after I saw her Goat Cheese, Strawberry and Basil Salad. 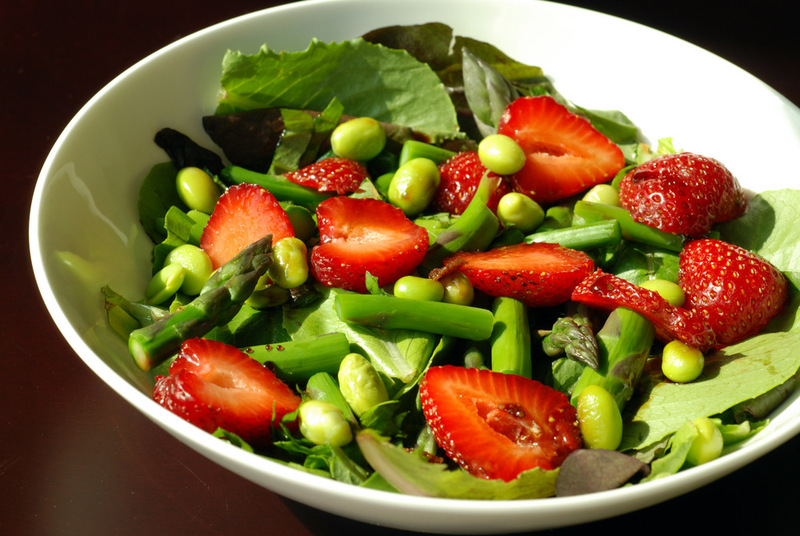 I trotted off to buy some cheap asparagus to go with my ripe strawberries, and was pleased how everything came into place at the grocery store (my new favourite grocery store, better than Bestwin!). Ontario asparagus was $1.99 a pound, and wasn’t even advertised. I picked the bunch with the thinnest stalks. I had mint at home, so I had planned to forgo basil. However, they had the biggest bunches of basil that I ever did see. Complete with roots, they were that fresh. It tipped my scales at 290g for $1.50 (again, not advertised). I scored a 1-lb clamshell of baby spring mix for $1.99. They have random containers marked down, but it looked fresh and with an expiry date a week away, I saw no reason not to buy it. I had my juicy strawberries already, so I was all set! At home, I quickly assembled my salad for one. Steamed my asparagus, quickly blanched some edamame (frozen beans are great for small amounts), thrown overtop the baby greens and basil and drizzled it with mosto cotto. Yes, I christened my Eatalian mosto cotto with this salad. It was divine. Simplicity at its finest. Mosto cotto (also known as saba), is a a condensed balsamic vinegar made with reduced Concord grapes and then aged for at least 12 years. I was introduced to mosto cotto when Chef Gentile from Buca was at Tastes of Tomorrow. He used it as a finish for a red wine, cinnamon, clove-marinated beef heart salad with grilled radicchio di Treviso, balsamic braised chipling onions, Tallegio cheese, crispy sage, dandelion greens and pickled fig, lightly drizzled with olive oil and mosto cotto. It was delicious. He highlighted that certain ingredients are worth their weight in gold. Mosto cotto is an expensive balasmic vinegar, but still considered a poor man’s balsamic vinegar. Compared to the traditional balsamic vinegar it doesn’t compare: it is a thicker syrup with a deep, complex and sweet flavour. I have been wooed to the dark side and recommend searching it out (Amazon.com sells it, and should be found in specialty Italian grocers – I bought mine at Eataly while in New York City). In this recipe, you could substitute a balsamic syrup by boiling down some balsamic vinegar, or just use a good quality balsamic vinegar. 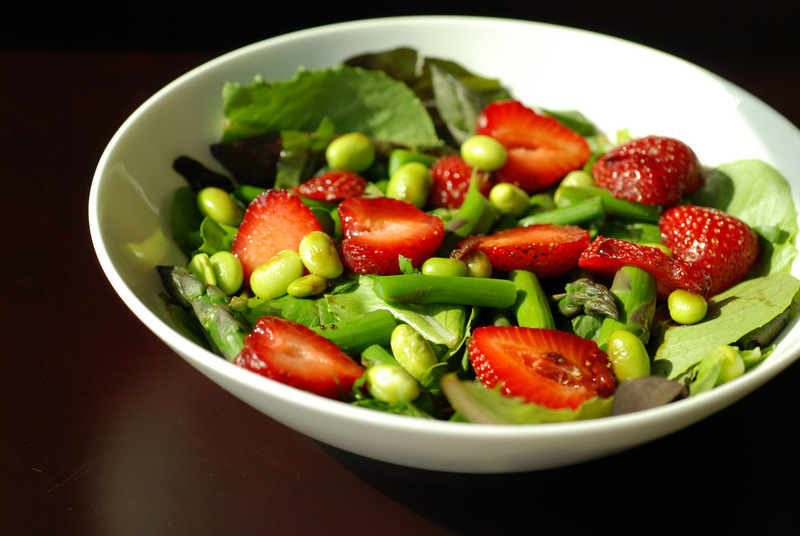 This is my submission to Deb for this week’s Souper Sundays, to this week’s Healthy Vegan Friday, to this week’s Ingredient Challenge Monday for strawberries, to this month’s My Legume Love Affair, hosted by Smitha of Kannada Cuisine, this month’s No Croutons Required featuring asparagus and to this month’s Simple and in Season for May. The next day, after work, I tackled the rest of my week’s menu which included this smoky tempeh and chard stew, adapted from Appetite for Reduction. It came together seamlessly, as I prepped while things steamed, fried and simmered. 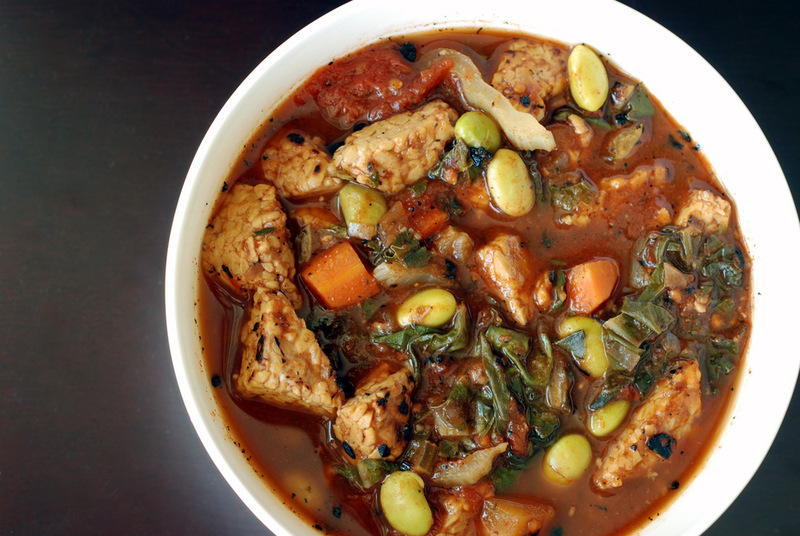 I obviously decided to make this stew last week, when we were in the midst of heavy, dreary rainy weather. It was a hearty stew, and after a few tweaks, filled with ingredients already in my kitchen when I didn’t want to head out to the grocery store. Unfortunately, by the time I made it (or fortunately, depending how you look at it), the weather turned around completely. This week we have been enjoying sunny, bright days with highs around 18C. Perfect, spring weather. 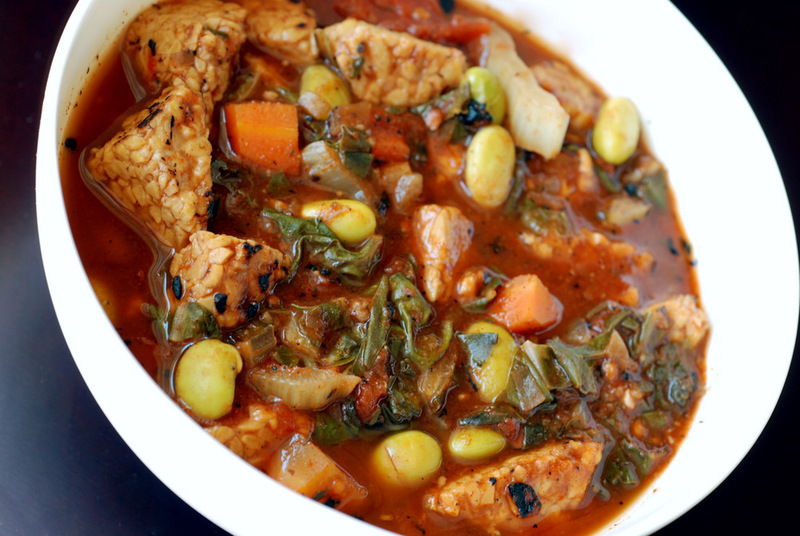 More akin to spring salads, but this smoky tempeh stew still tastes great. 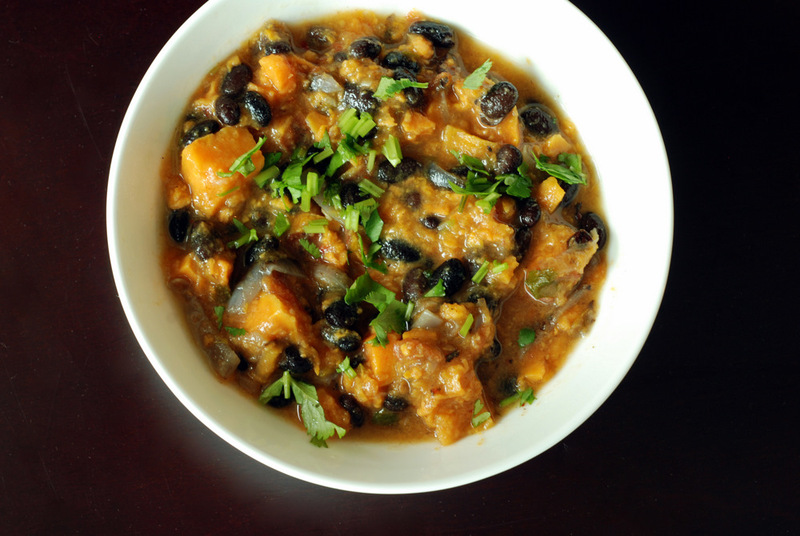 I should judge the difficulty of recipes on my ability to make them after a bike ride (yam and black bean stew, I’ve got my eyes on you!). To be honest, I don’t think any of my recipes are hard to make (heck, even I can make it!) but I know some can be lengthy, especially if dried beans are involved. Last weekend, I cycled to Kitchener with a friend. We opted to take a shorter route home, cycling to the Aldershot GO Station in Burlington and training the rest of the way home. I cycled 209km that weekend, and with the shorter distance on Sunday, it meant I was home by 3:30pm and able to do some weekend chores. Thank goodness I still had some delicious leftover raw pad thai for dinner that I picked up from Thrive Juice Bar in Waterloo (which travelled incredibly well over 80km on my bike!). (Their big green juice with maca was also exactly what I needed when I finally arrived in Waterloo). 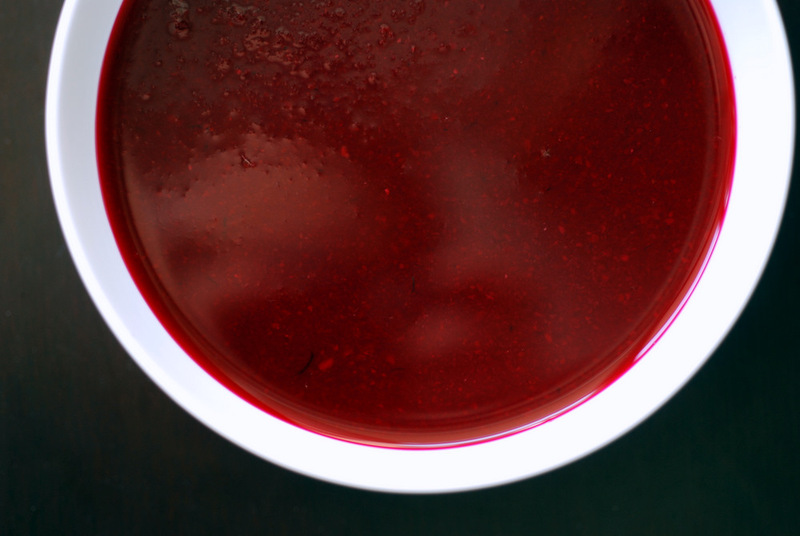 Anyways, I had a few recipes on my week’s menu, but was only able to muster enough energy to make this Orange Beet Soup, adapted from The 30-Minute Vegan. I figured it would be a simple thing to throw together and should take under 30 minutes, right? Obviously, in my post-cycle haze, my coordination (hand and mental) decrease. It took me more like 45 minutes and I didn’t even grate my vegetables by hand (thank you food processor!) plus another 15 minutes to clean (curse you food processor!) . I peeled my beets which took up a lot of time, and probably unnecessary in retrospect. Anyways, I will see if my kitchen speed increases if I were to make this at any other time. Because this is a great soup and should get repeated. Like when I have a garden filled with beets (oh yes!). Simple ingredients layer to create a nice, light, flavourful soup. 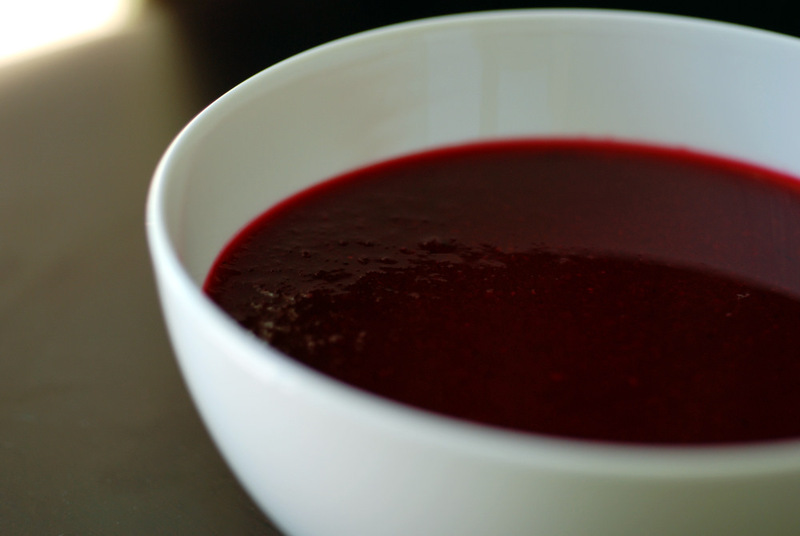 Beet is at its core, but it is sweet from the layers of orange and carrots. The dill add another dimension with a nod to the Eastern European pairing of beet and dill, and the red miso creates that subtle complexity. This soup is great warm and chilled. Chilled, it is a refreshing and bright starter and if I had a high-powered blender, this would make this the ultimate savoury summer drink (my immersion blender left a bit of pulp, which is fine for something labelled as soup). I cleaned up my kitchen and called it a night and fell asleep around 8pm, before the sun had even gone to bed. So what kind of meal would you make if you were hosting a dinner party after cycling 100km? Without going to the grocery store, to boot. 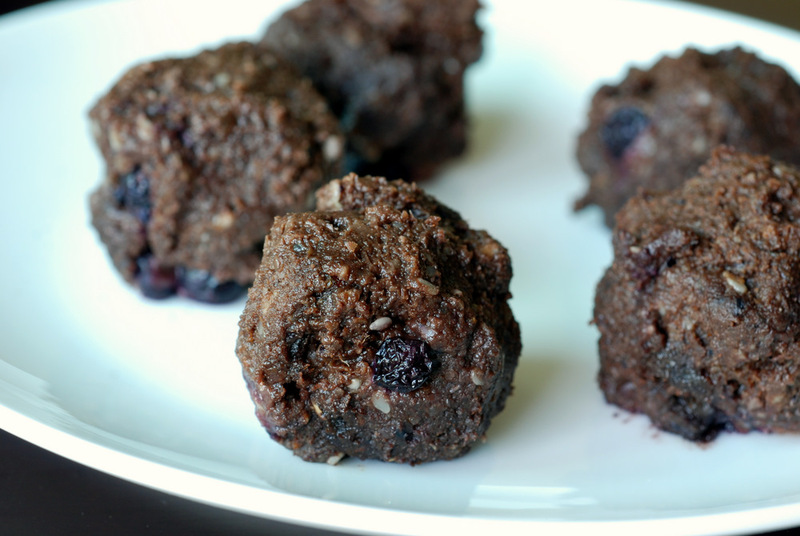 While I prefer not to try new recipes on unsuspecting guests, I warned my brother and sister-in-law that this was a new recipe… AND that I would likely be pooped post-bike ride. They were fine with the menu. The most important part of having them over is not about the food, you see, it was about catching up. How their plans for puppy parenthood are progressing, moving plans on both ends, and since my apartment is now on the market to be rented, it has never looked cleaner. Oh, and games. Fun was had by all as we introduced them to Bananagrams and Dominion. I still get a bit stressed when choosing a menu for guests. My tastes have changed and I would like to showcase how great the food tastes. A bit harder to do without rehearsing a recipe, but I trusted the complementary flavours within this soup stew. 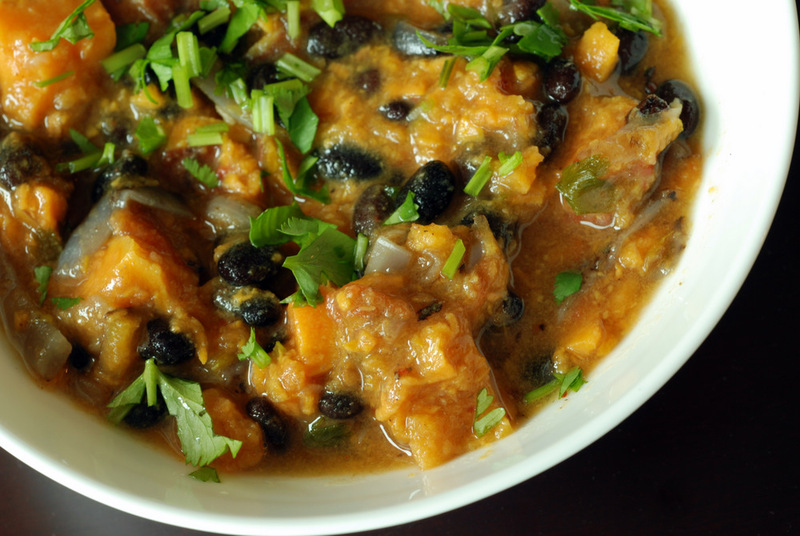 Yam, black beans, orange, cilantro – what’s not to like? 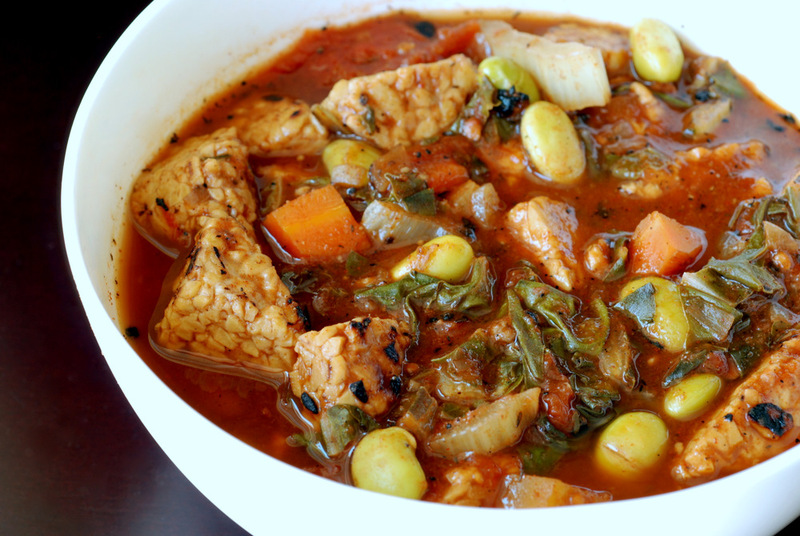 I adapted this recipe from Appetite for Reduction to create a heartier soup, I mean stew. I decreased the amount of yam, increased the black beans, used canned tomatoes instead of fresh and, of course, used Aleppo chili flakes instead of the serrano peppers. 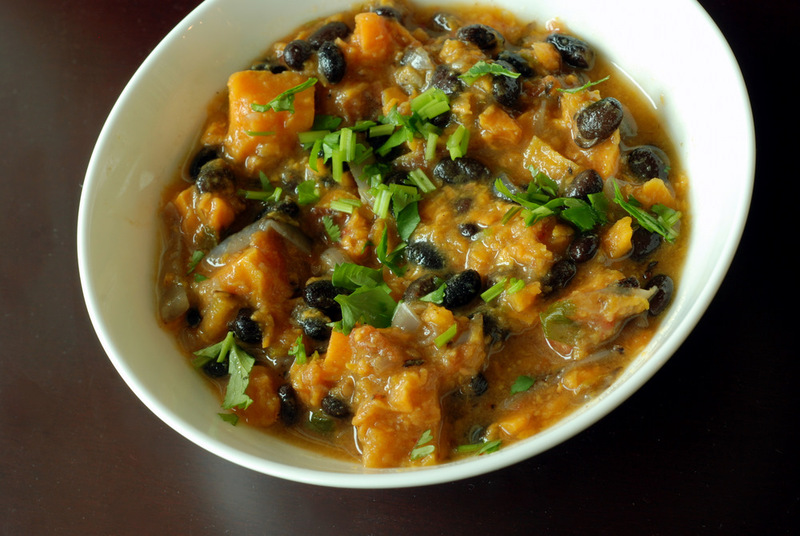 The yams, partially mashed, created a creamy consistency which meshed well with the extra black beans. I squeezed 2 Navel oranges to acquire 1 cup of fresh orange juice. This added more of a lightness to the soup, rather than an intense orange flavour. 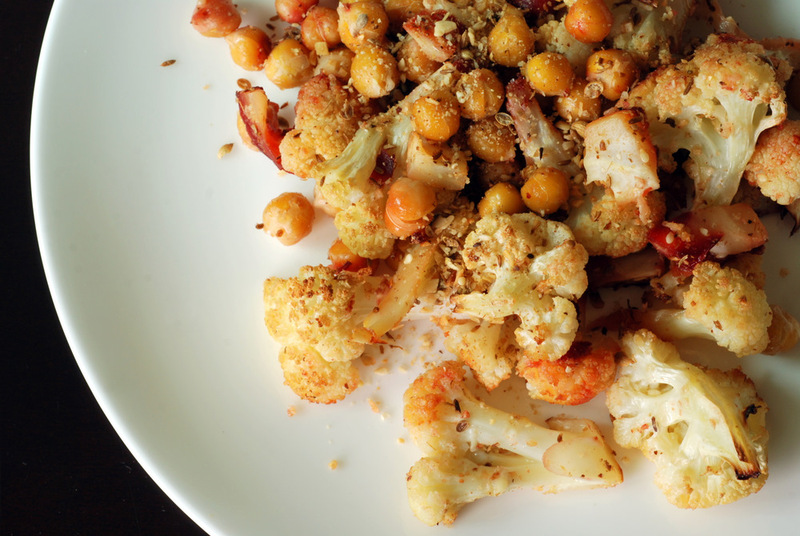 The sweet cilantro and orange paired well with the slight zing from the Aleppo pepper. 1) It is a very easy recipe easy. I had no problems whipping this up after the bike ride, since it came together quite seamlessly. 2) It serves 8, so there was plenty of food for seconds. And (souper) leftovers for me! 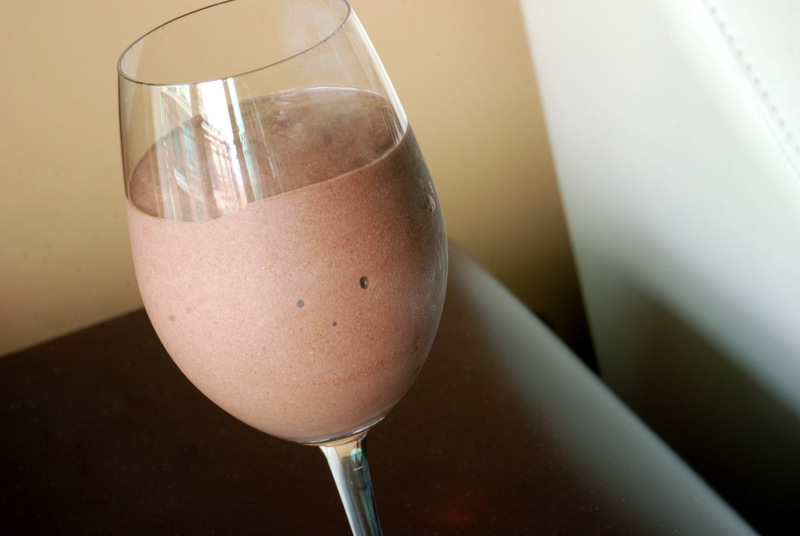 4) For recovery meals after endurance-based exercise, this was ideal with a high carb content. As is, this has a 1:5 protein:carb ratio, but enjoy it with a glass of soy milk for an overall 1:3.5 ratio. Apparently, liquid-based meals are easiest to digest while in recovery so a soup is perfect. Sounds like a winning meal for everyone.